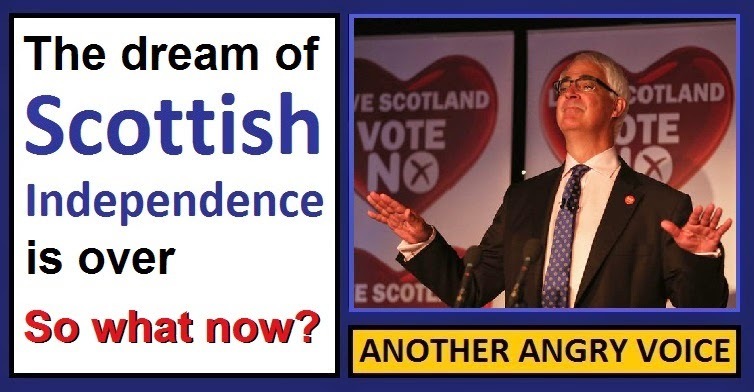 The dream of Scottish independence is over, so what now? I'm disappointed, but not surprised at the outcome of the Scottish independence referendum. It's no surprise that a lot of voters didn't dare to defy the entire Westminster establishment, the whole mainstream media (except the Sunday Herald), the outrageously biased BBC (reputation surely tarnished beyond repair now), the bully boy banks (who were bailed out by us just a few years ago when they caused the crisis that the Tories have so gleefully exacerbated through ideological austerity) and countless businesses who were pressurised by the government into making ridiculous threats (price rises, relocations, job cuts etc). You can't blame people for being afraid and making what they consider to be a conservative decision. However many "undecided turned no" voters may live to regret their decision in 2015 if the UK ends up with the nightmare scenario of a Tory-UKIP coalition (Boris and Nigel) hell bent on punishing Scotland for daring to even have such a referendum, and dragging Scotland out of the EU, (no matter which way the people of Scotland vote on the matter). Many people have simply failed to realise that uncertainty cuts both ways. It is saddening that the figureheads of the Westminster establishment are taking this result as a glowing endorsement of their unified agenda of austerity and privatisation, rather than a simple demonstration that their fear campaign just managed to overpower the hope that Scotland could do better without people in London holding the purse strings. The people of Scotland have voted to allow London to continue taking the bread of Scotland's incredible wealth of natural resources and for the the Scottish parliament to continue distributing the few crumbs that fall off the Westminster establishment's table. All the while with the right-wing press shrieking "look at those disgusting Scottish scroungers stealing our crumbs". The people of Scotland have voted to allow the Westminster establishment to continue parking their outrageous stockpile of (privatised) Weapons of Mass Destruction just 30 miles from their biggest city. The people of Scotland have voted to allow politicians in London to continue imposing disgraceful stuff (Poll Tax, "Bedroom Tax" Royal Mail privatisation ...) that the majority of the Scottish electorate strongly oppose. The people of Scotland have passed up this extraordinary opportunity to effect real political change and take more control over their own destiny. So what now? The first thing to do must surely be to demand all of the additional powers that were promised, because we all know that David Cameron and Nick Clegg are about as trustworthy as a bad case of herpes. If the people of Scotland want any of these last minute promises to be fulfilled, they'll have to work hard to ensure that they are, because there are already growing calls for the "timetable" to be torn up and thrown away. The calls to renege on these promises are being led by Tories like Boris Johnson (the man who wants to impose a 50% turnout threshold on trade union ballots despite being elected mayor of London on a 38% turnout) Claire Perry (the woman who thinks a debt and a deficit are "the same thing") and James Gray (a man who used a charming junkie analogy to demand that Scotland be punished for their audacity and banned from ever obtaining more autonomy from Westminster: "talk about feeding an addiction. The more you give them, the more they want"). It would be crazy if the Welsh and Northern Irish didn't make demands that they also get the kinds of additional powers that the three stooges were prepared to offer to Scotland during their last minute panic. I've got less faith that anything serious will be done to devolve political power in England, given that the English have mainly been content to allow the Westminster establishment to continue ruling over them with impunity, and do little more than just whinge about the unfairness of Scotland getting free prescriptions. There are two devolution options for England. 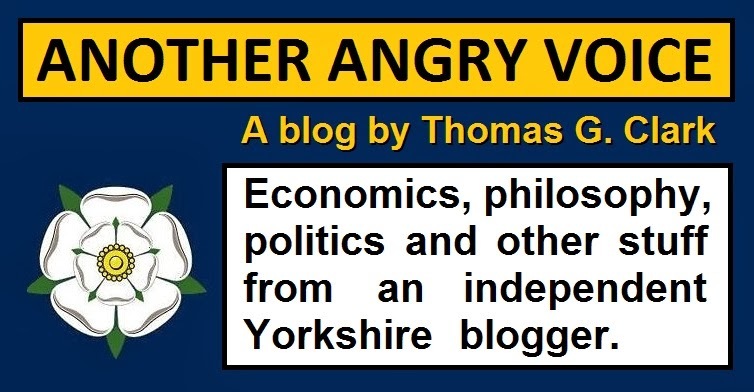 Either a single English parliament, or a number of regional parliaments for areas like Yorkshire, Cornwall, London etc, but maintenance of the ridiculous status quo is much more likely because the Westminster establishment are notoriously reluctant to give away any of their powers without a big fight, and the English electorate simply don't seem to have the balls to stand up and demand the greater political representation that the Scottish, Welsh and Northern Irish have had for years. Another thing that should be done is preservation of the incredible grass-roots movements that grew up around the independence campaign. These movements did not quite achieve the independence they wanted, but they did inspire hundreds of thousands of people to get more involved in politics, which is a very good thing in its own right. 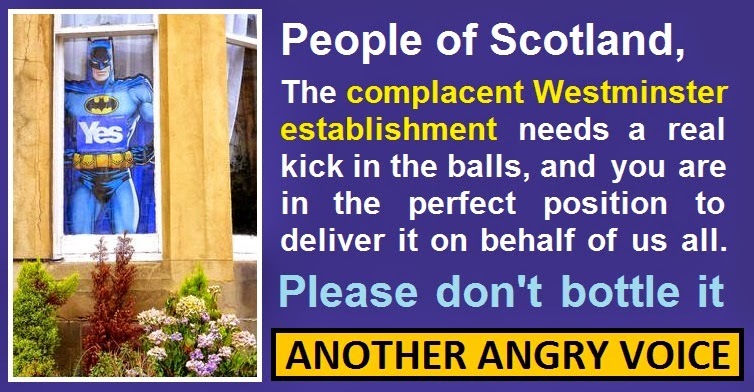 These politically engaged communities shouldn't be left to wither and die because they can still be used to effect political change, it's just that the changes will be even harder to achieve from within the Westminster straight jacket that the majority of Scottish voters have apparently endorsed. It is undeniable that Scotland can still be made a better country if enough people are prepared to stand up and demand it. Update: Alex Salmond was announcing his decision to retire pretty much at the same time I was writing this article, raising more questions. Who will be the next First Minister of Scotland, and what political direction will the SNP take?